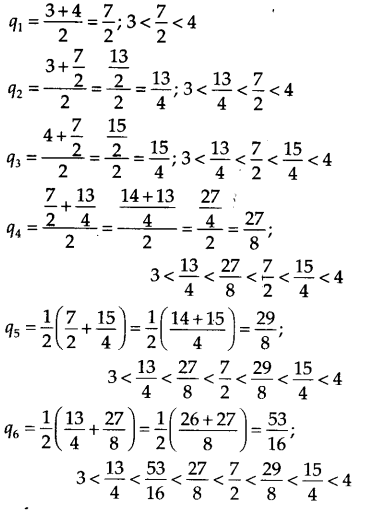 NCERT Solutions for Class 9 Maths Chapter 1 Number Systems Ex 1.1 are part of NCERT Solutions for Class 9 Maths. 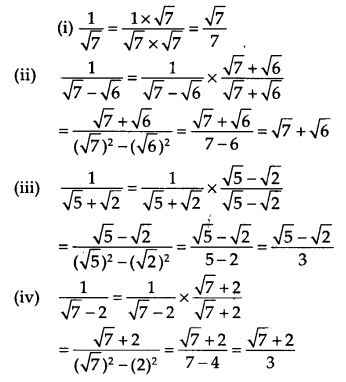 Here we have given NCERT Solutions for Class 9 Maths Chapter 1 Number Systems Ex 1.1.
,where p and q are integers and q ≠0? etc. 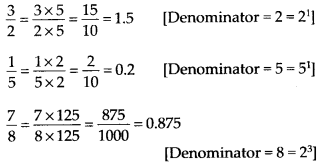 denominator q can also be taken as negative integer. and 4, where j = 1 to 6. Since, we need to find five rational numbers, therefore, multiply numerator and denominator by 6. State whether the following statements are true or false. Give reasons for your answers. (i) Every natural number is a whole number. (ii) Every integer is a whole number. (iii) Every rational number is a whole number. ∵ The collection of all natural numbers and 0 is called whole numbers. ∵ Negative integers are not whole numbers. ∵ Rational numbers are of the form p/q, q ≠ 0 and q does not divide p completely that are not whole numbers. State whether the following statements are true or false. Justify your answers. (i) Every irrational number is a real number. (ii) Every point on the number line is of the form √m , where m is a natural number. (iii) Every real number is an irrational number. Because all rational numbers and all irrational numbers form the group (collection) of real numbers. Because negative numbers cannot be the square root of any natural number. Because rational numbers are also a part of real numbers. Are the square roots of all positive integers irrational? If not, give an example of the square root of a number that is a rational number. No, if we take a positive integer, say 9, its square root is 3, which is a rational number. Show how √5 can be represented on the number line. Draw a number line and take point O and A on it such that OA = 1 unit. Draw BA ⊥ OA as BA = 1 unit. Join OB = √2 units. Now draw BB1 ⊥ OB such that BB1 =1 unit. Join OB1 = √3 units. Next, draw B1B2⊥ OB1such that B1B2 = 1 unit. Again draw B2B3 ⊥OB2 such that B2B3 = 1 unit. Join OB3 = √5 units. Take O as centre and OB3 as radius, draw an arc which cuts the number line at D.
represents √5 on the number line. 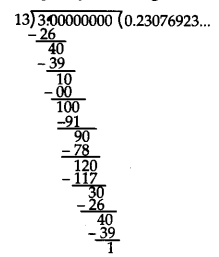 Here, the repeating block of digits is 18.
are , without actually doing the long division? If so, how? 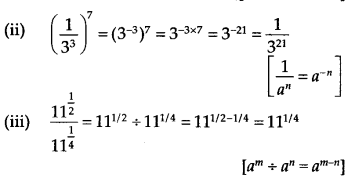 Thus, without actually doing the long division we can predict the decimal expansions of the given rational numbers. where p and q are integers and q ≠ 0. (i) Let x = 0. 10x – x = 4.777…… – 0.4777……. (iii) Let x = 0. Are you surprised by your answer? With your teacher and classmates discuss why the answer makes sense.
? Perform the division to check your answer. , In the divisor is 17. Since, the number of entries in the repeating block of digits is less than the divisor, then the maximum number of digits in the repeating block is 16. The remainder I is the same digit from which we started the division. Hence, our answer is verified. (q ≠ 0). Where, p and q are integers with no common factors other that 1 and having terminating decimal representations (expansions). Can you guess what property q must satisfy? We observe that the prime factorisation of q (i.e. 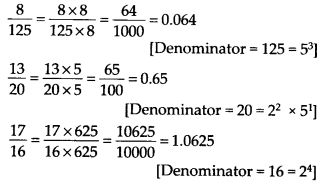 denominator) has only powers of 2 or powers of 5 or powers of both. Write three numbers whose decimal expansions are non-terminating non-recurring. Three irrational numbers between 0. 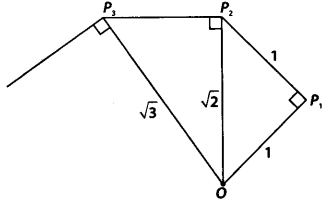 (1) ∵ 23 is not a perfect square. ∴ 225 is a perfect square. (iii) ∵ 0.3796 is a terminating decimal. ∴ It is a rational number. is a non-terminating recurring (repeating) decimal. (v) Since, 1.101001000100001… is a non terminating, non-repeating decimal number. ∴ It is an irrational number. Visualise 3.765 on the number line, using successive magnification. 3.765 lies between 3 and 4.
on the number line, upto 4 decimal places. or 4.2626 lies between 4 and 5. 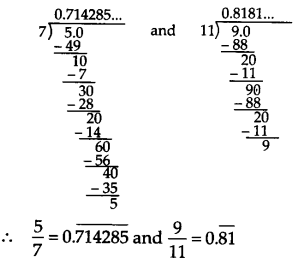 Classify the following numbers as rational or irrational. (i) Since, it is a difference of a rational and an irrational number. ∴ 2 – √5 is an irrational number. which is a rational number. , which is a rational number. (iv) ∵ The quotient of rational and irrational number is an irrational number. (v) ∵ 2π = 2 x π = Product of a rational and an irrational number is an irrational number. ∴ 2π is an irrational number.
. This seems to contradict the fact that n is irrational. How will you resolve this contradiction? When we measure the length of a line with a scale or with any other device, we only get an approximate ational value, i.e. c and d both are irrational. is irrational and hence π is irrational. Thus, there is no contradiction in saying that it is irrational. Draw a line segment AB = 9.3 units and extend it to C such that BC = 1 unit. Find mid point of AC and mark it as O. Draw a semicircle taking O as centre and AO as radius. Draw BD ⊥ AC. 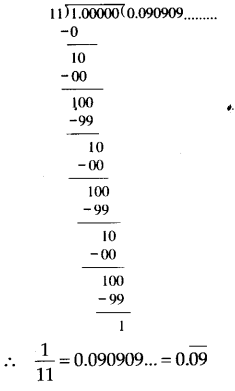 We hope the NCERT Solutions for Class 9 Maths Chapter 1 Number Systems Ex 1.1, help you. If you have any query regarding NCERT Solutions for Class 9 Maths Chapter 1 Number Systems Ex 1.1, drop a comment below and we will get back to you at the earliest.